So what investing strategy does Green recommend for you and me? Indexing, of course. He doesn’t spend any time throwing darts at active management. He simply explains that most people would be better off managing their own money in a simple, low-cost, highly diversified portfolio that requires minimal maintenance. I’m confused. How does his portfolio allow us to beat the market? Or is he saying “If you want to beat the market, you need to spend 1000s of hours stock picking. 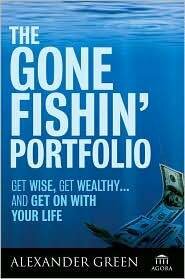 So just forget about that, use this portfolio, and go fishing.”? My preference would be for a smaller number of ETFs, say 3-4 broad ETFs. Keep it even simpler. Rebalancing can be done, for example, with fewer trades. @Marz: He’s advocating the latter: that is, don’t bother trying to beat the market, simply use this indexed portfolio and you’ll do very well. In his experience, it is possible to beat the market if you invest thousands of hours, but even then it’s no guarantee. What’s your opinion on EMH? Do you think that the advantages of index fund investing depends on having efficient markets? So, does anyone have a list of ETFs or index funds that correlates with each of these asset classes listed by Green as part of his suggested portfolio? I think I have most of the classes covered off in my couch potato portfolio already but not high-yield corporate bonds or inflation-protected bonds. And how would you build in the Canadian equity that’s always recommended for a Canadian investor, in addition to the US equity? Split them 50/50? Can you tell I’m still learning and refining my approach to this? @chantl01: Have a look at my ETFs page for a complete list. Both iShares and BMO have real-return bond ETFs; Claymore, iShares and BMO have high-yield bond funds. Green’s portfolio is 30% US equity and 30% international. A Canadian could simply go with 20% each to Canada, US and international. @Brian: I believe that markets are largely efficient, but clearly they are not perfectly so, or we would never have bubbles. In most cases, any inefficiencies in the markets cannot easily be exploited by active managers. Nice review. Good reinforcement for many of us. Thanks Dan. “The market” is one of the major groupings of stocks like the Dow Jones, the S&P 500, or the NASDAQ. Each of those entities returns “x” percentage a year and one can invest in those through investing in, “index funds” that mirror what those markets do. What Green is saying is that very few people consistantly beat the returns of, “the market” by investing money in non-index funds or individual stocks. The Gone Fishin’ Portfolio beats, “the market” by not only investing in index funds that mirror “the market” (like VTI), but by also diversifying in other areas such as precious metals, REITS, and foreign funds. I use Green’s plan and am doing quite well. @Newbie: The RBC fund is a traditional mutual fund, bought and sold in Canadian dollars with no commissions. The Vanguard funds are ETFs bought and and sold in US dollars, with a trading commission on each purchase and sale. So the former makes more sense for small portfolios and people who make monthly contributions. ETFs are a better choice for large portfolios and less frequent transactions. Got it…so sticking in the index fund world then, what are the major differences between something like an iShares index vs one of the bank indexes? Knowing that MERs seem to generally be lower with iShares, why would one opt for a higher fee TD or RBC index instead? Thank you! @Newbie: The iShares products are all ETFs, not index mutual funds. So they have the same drawbacks—namely trading costs every time you buy and sell. As for TD versus RBC mutual funds: the TD funds are only available to TD customers. If you happen to have a brokerage account anywhere else, then then the RBC funds are the next best choice. Green’s recommended Vanguard ETFs are very attractive because their extremely low management fees are lower than several of the equivalent iShare or BMO funds. Does this cost saving outweigh the currency fluctuation risk if held in a Canadian dollar RRSP? How does the following look for a Canadian with more than $50,000 to invest? @KLF: Diversification is important, but In my opinion your suggested portfolio is way too complicated for $50K. The cost of maintaining a portfolio like this would almost surely overwhelm any diversification benefit one might get. People seem deeply resistant to simple solutions, but the Global Couch Potato is more than adequate for any portfolio under $100K, and the Complete Couch Potato is likely to be adequate for almost any portfolio size. I am Canadian, 59 years old, will retire in 2 years (as will my wife), and have a $140K portfolio (RRSP) with a financial advisor with whom I am dissatisfied (poor performance for the last 5 years). We have sufficient other assets (and a reasonable govt pension plan thanks to my wife) so that we will retire comfortably. In other words, the $140K is not ultra-critical to our financial planning, and I do not expect to draw down this RRSP until age 71, when I have to. I am interested therefore in trying out the CCP strategy. Given that I have a relatively short time-horizon, does this make sense? And if so, what risk-tolerance level would typically be recommended given my situation? What asset mix would make sense? @Jean: Indexing is appropriate for investors of any age, time horizon or goal. The issue is finding the appropriate asset allocation, and there is no way to do that without a thorough financial assessment. My book is probably a good start: The MoneySense Guide to the Perfect Portfolio. Ok, thanks, I will get the book and start there. I loved this book and the concept, however I am contemplating on investing with a company called WealthBar which is a online brokerage charging 0.60 % MER for managing your portfolio and diversifying with Index ETFS. They take care of all the fees and the rebalancing and i was wondering if you see any drawbacks to this method.